Can I File a Chapter 7 Bankruptcy While in a Georgia Workers’ Compensation Case? If you are injured on the job, unable to work and your employer and its insurer does not fight your claim, you will receive TTD (temporary total disability benefits) that equal to 66 2/3 of your average weekly wage with a maximum check of $575 per week. Federal tax law provides that workers’ compensation benefits are not taxable, so your TTD check is roughly equivalent to net, after-tax pay. $575 per week equals $29,900 net pay. If you earn less than $35,000 to $40,000 gross pay, your workers’ compensation TTD benefit will roughly make you whole. If you earn more than $35-40,000, your workers’ compensation benefit will leave you with a budget shortfall. It has been my experience that very few people find that their TTD benefit check allows them to maintain their regular budget. This imbalance increases with higher earning individuals. If you were living under a tight budget before your work injury, your loss of regular income (and any possible overtime or bonus pay) may lead you to consider either Chapter 7 or Chapter 13 bankruptcy. My husband and law partner, Jonathan Ginsberg, practices consumer bankruptcy law here in the Atlanta area and I have asked him to explain how filing Chapter 7 or Chapter can impact a workers’ compensation case. What follows is a discussion about Chapter 7 – click on the link to read Jonathan’s thoughts about Chapter 13 and workers’ compensation. 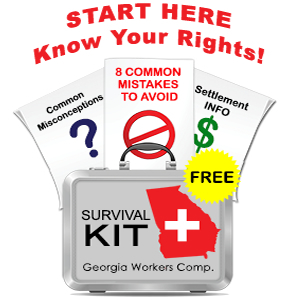 The is no restriction on filing Chapter 7 bankruptcy while you are collecting or pursuing Georgia workers’ compensation benefits. However, before filing you should discuss your plans with both your workers’ compensation lawyer and your bankruptcy lawyer. Many Chapter 7 debtors want to keep their houses or vehicles and that can be done in Chapter 7 – you can “reaffirm” secured debts if you are current with your payments, there is little or no equity in the property and your budget reflects the ability to make on-going payments. often, Chapter 7 filers turn to credit cards and other short term loans to pay their bills prior to considering bankruptcy. If you have incurred hundreds or thousands of dollars of cash advances or credit card purchases during the past few months, those charges may not be dischargeable under the argument that you had “no reasonable expectation of repayment” when the charges were made. Despite these concerns, Chapter 7 can be very appropriate when you are facing a reduced income because of your workers’ compensation claim. Chapter 7 debtors must pass something called a “means test.” The means test asks whether you have enough disposable income to pay back some or all of your debt in a Chapter 13. Reduced household income can make it easier for you to qualify under the means test, when you might not have qualified using your regular salary. As you can see, there are numerous considerations to keep in mind when looking at Chapter 7. You are always best served by seeking bankruptcy advice as soon as you sense that there is a financial problem brewing.